The Inverted Head and Shoulders Bottom, looks exactly the same as a Head and Shoulders top, except that it is upside down. They are one of the most common and reliable reversal formations. The Head and Shoulders Bottom reversal pattern is made up of a left shoulder, a head, a right shoulder, and a neckline. Prior Trend: With any reversal pattern, there must be an existing down-trend to reverse. Left Shoulder: While in a downtrend, the left shoulder forms a trough that marks a new reaction low in the current trend. After forming this trough, an advance ensues to complete the formation of the left shoulder. The high of the decline usually remains below any longer trend line, thus keeping the downtrend intact. Head: A second decline carries the stock below the low point of the left shoulder; then a second rally carries it back to the vicinity of the previous rally's high. Volume also increases on this second decline. Right Shoulder: A third decline fails to reach the low of the second, and another rally develops. Volume should taper off on this decline, and pick up on the climb of the right shoulder, right through to the break-out. 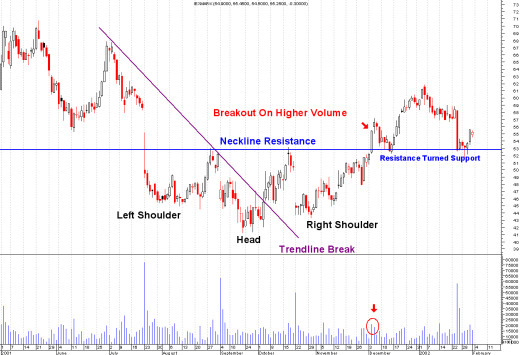 Neckline Break: The Head and Shoulders Bottom pattern is not complete, and the downtrend is not reversed until neckline resistance is broken, with high volume. Price Target: After breaking neckline resistance, the projected advance is found by measuring the distance from the neckline to the bottom of the head. This distance is then added to the neckline to reach a price target. Any price target should serve as a rough guide. While it is preferable that the left and right shoulders be symmetrical, it is not an absolute requirement. Shoulders can be different widths as well as different heights. Keep in mind that technical analysis is more an art than a science. If you are looking for the perfect pattern, it may be a long time coming. Analysis of the Inverted Head and Shoulders Bottom should focus on correct identification of neckline resistance and volume patterns. These are two of the most important aspects to a successful read, and by extension a successful trade. Return from "Inverted Head and Shoulders Bottom" to the Home Page: "Stock Market For Beginners"